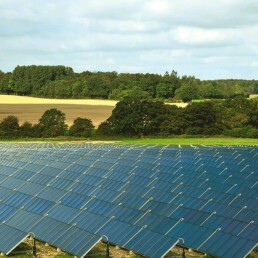 In the suburban area of Graasten in Denmark, solar power and biomass have replaced fossil fuels as the energy sources for the local district heating system. Homes and industrial buildings in the Graasten suburban area of Sonderborg in Denmark now receive heat generated exclusively from biomass and solar power. Solar collectors totalling 20,000 m2 are used to heat water, which is piped and used to heat homes and industrial facilities in the area. When the solar energy yield is insufficient, boilers that burn locally-sourced and carbon-neutral straw take over. In addition, PV solar panels on the facades of the Graasten District Heating building produce one-third of the electricity needed by the facility. Green and CO2-neutral district heating secures a local and cheap solution for the next 20 to 30 years – a real win-win for the environment. Peter Mikael Stærdahl – Director, Graasten District Heating. Since 2012, around 1,500 households and several commercial buildings have been connected to Graasten’s district heating system. Customers have saved substantially on their heating bill since the transition to carbon-neutral district heating. The heating and hot water for these buildings is 100% carbon-neutral. According to the International Energy Agency, heating accounts for 47% of global energy use. District heating and cooling is identified as one of the key innovations that can make a significant contribution to reducing emissions of carbon dioxide and air pollution. By 2050, solar power can produce more than 16% of the energy used for low-temperature heating annually, making access to clean heating energy more affordable. With the use of biomass or solar energy, district heating systems such at the one in Graasten can be retrofitted to limit or eliminate their pollution. Using solar power for primary heating, and replacing fossil fuels with biomass for backup heating, saves Graasten about 10,000 tonnes of CO2 annually. Arcon-Sunmark is a merger between two companies within the field of large-scale solar heating – ARCON Solar and Sunmark. Graasten District Heating has completed its construction of the world’s largest combined thermal solar heating and absorption heat pump plant, reducing their current CO2-emissions by more than 90 %. Plans are already made for expanding the new plant to cover a larger supply-area and fully replace fossil fuels in future CHP production in Graasten. Weiss A/S is a Green Profile company, with long experience in environmental and efficiency optimized combustion. They specialize in waste and biomass combustion solutions with company history dating back decades.